"It's always like this when Darling's sickness manifests itself." To call Urusei Yatsura "wacky" is an understatement. Let's start with the premise: A race of horned aliens, called the Oni (Japanese for "devils"), return to Earth and threaten to take it over unless their champion can be defeated in their national sport—tag. Chosen at random is Ataru Moroboshi (Toshio Furukawa), probably the worst possible choice for the assignment, as there is no one with worse luck on the planet. Even he is not up to the task until he spies his opponent, the lovely tiger stripe bikini clad Lum (Fumi Hirano). If there is one thing Ataru is good at, it is being a lech, so the opportunity to chase Lum is one he can't pass on, despite a promise from his girlfriend Shinobu Miyake (Saeko Shimazu) that she will marry him if he wins—which he does, but ends up married to Lum instead due to a misunderstanding. With his girl chasing ways, Ataru is under constant vigilance from his new wife, who has a shocking way—literally—of dealing with his skirt chasing, and at the same time he is the envy of all his classmates who lust after the shapely Lum. Add to the mix Lum's fire-breathing baby cousin Ten (Kazuko Sugiyama), the obnoxious monk Sakuramboo (who goes by the name "Cherry"), his niece Sakura (Machiko Washio), who is now the high school nurse, but is also a Shinto princess, and a host of other characters who continue to join the cast with each episode, and you have a recipe for riotous fun and misadventure. Each numbered episode is actually two parts, though most share a theme or setting. Episode 13 finds Lum, Ataru, Shinobu, Sakura and others staying at a seaside resort. When the girls' swimsuits start disappearing, Ataru is the primary suspect. However, things begin to point towards Cherry being the culprit, as the gang hunts for the Hawaiian Swimsuit Thief. Next, gulp, it's an all-you-can-eat challenge at the Full Course from Hell, as Ataru, Cherry and Sakura try to swallow everything but their pride in order to win a free meal. Back at Tomobiki High School, the ultra rich, good looking and powerful Mendou Arrives With Trouble! for his first day of school, instantly coming at odds with Ataru over the candidacy for class president. This results in an explosive duel to decide the winner. In Constellation-Go-Round, Lum decides to an astrological device to determine her true mate, and once again Ataru and Mendou are on opposite sides of the equation. Great Kiss War introduces goddess and biker babe Benten (Yuuko Mita), who is Lum's opponent in an annual gaming ritual, and as expected Ataru is there to mess everything up. In The Benten Corps' Return Match, the goddess returns to help rid the world of Oni. A new teacher is on campus in Oh, Lonely Teacher!, and like everyone else, Kuribayashi Sensei is immediately at odds with Ataru while lusting after Lum—will he get his way by exposing his true feelings to her? Finally, meet the parents day turns into all out war in Terrible Inspection Day, as both Menou and Lum's mothers show up for the event. What makes UY so enjoyable is the plethora of unique and whacked out characters involved, which provides unlimited possibilities for conflicts of the weirdest kinds. Since my first encounter with Lum, she has become an instant favorite, and her trademark "Darling" can be found in many series inspired by this show. If you are completest like I am, Urusei Yatsura is a daunting undertaking, but the episodic nature of the show allows for a less concentrated approach than some other series, which need a steady stream of concentration to carry the storylines. The older animation style may be a turnoff to some, but like most older series, I feel that this only adds to their charm. For lots of silly fun, it's pretty hard to beat Urusei Yatsura. Image Transfer Review: I have to split the video review for this disc in two, since the video quality of the first episode is not indicitive of the remaining three episodes. Episode 13 contains a lot of rainbowing on outlines, which I found quite distracting and also unexpected from the one other disc I'd seen in the series. The remainder of the episodes don't exhibit this problem, and look very good, with solid blacks and colors, and very little in the way of artifacting, though the program does show its age with occasional print defects. There are minor interlace issues and a bit of racking in the transfer, but overall this looks quite good. I'd give the first episode a C with the remainder taking a solid B+. Audio Transfer Review: Audio is in Japanese only (except for a bit of alien language in the final episode), and for the most part is solid, aside from a moderate amount of hiss. Dialogue is clean, as is background music. Frequency range is somewhat limited, but the presentation suits the program material. Extras Review: Menu options only allow direct access to each of the 8 half episodes on the disc, with no chapter selection despite there being five within each episode. While there are no on-disc extras, Urusei Yatsura TV #4 does come with a set of copious liner notes which cover much of the subtlety and cultural references used in the show. Presented in an episode by episode format, they give background on the naming conventions, types of food being served, and activities we see throughout the show. This is a great addition, and one I wish we'd see more of. The cards themselves aren't anything fancy, but do have an index tab so that multiple sets can be stored together for quick reference. The back panel features a character biography for Cherry. 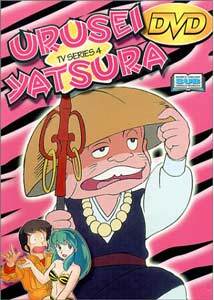 Urusei Yatsura is an outrageous and funny series with many distinct and interesting personalities. Our central alien, Lum, is a sight to see, and the scenarios she and her reluctant lech of a husband find themselves in always result in the humorously unexpected. The situations are preposterous, the comedy over-the-top, and each episode is pretty much self contained, though there are carry overs from show to show. A true anime classic, I'm looking forward to more!